Blythe and her best friends — Zoe the spaniel, Pepper the skunk, Sunil the mongoose, Vinnie the gecko, Russell the hedgehog, Penny the panda and Minka the monkey — are back for five more exciting escapades in the Littlest Pet Shop! Shout! Factory, in collaboration with Hasbro Studios, released Littlest Pet Shop: Strike A Pose! on DVD June 3rd, 2014. Featuring five wild episodes, this collection features Blythe and her friends filming a TV commercial, Sunil becomes an internet phenomenon, Vinnie befriends some dancing lizards and the Pet Shop welcomes a juvenile alligator into their midst! All of these adventures and more unfold in these five wild episodes of The Littlest Pet Shop! By now you all know that Littlest Pet Shop is definitely a show that is well known around my house. It not only is one of my daughter's favorite show to watch, but it also has gained the attention of my six year old son as well. What I love most about this show is that I can put it on and it entertains both my kids with teaching them about friendship. The bold and beautiful colors of all the characters stand out as well as the catchy sing a long songs that even have me singing them after a while. Strike A Pose includes five episodes that are filled with a new fun adventure with Blythe and the LPS gang. 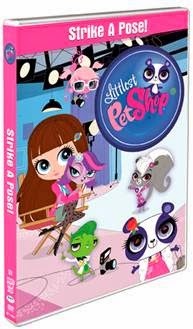 Definitely a must have DVD for any fan of The Littlest Pet Shop! Disclosure: All opinions are my own. I received Littlest Pet Shop: Strike A Post on DVD at no cost for the purpose of this review. No other compensation was received.